The stuffer, well, stuffs! It is used to force ground meat, or meat paste into casings. 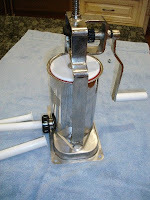 Again, this is a piece of equipment which is only necessary to make cured meats which involve ground meat. I guess I'm saving the most difficult piece of equipment to make, the curing chamber for last! This is the cheapest stuffer, an attachment for the grinder for the Kitchenaid mixer, and I bought it thinking, hey one less piece of equipment to buy, I have the grinder already. Wow was i ever wrong. Basically for $15 you get three stuffer tubes for different size casings, and a few pieces. 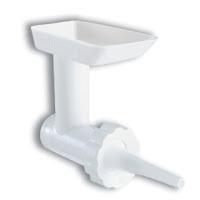 You put the tubes on instead of the cutter and grinder plates and, in theory, the meat paste is loaded into the top (like the meat cubes were) and is forced into the tube and then the casings by the auger. Unfortunately, all you end up with is a complete mash of the fat and meat that, with some luck, MAY end up in the casings, if you don't pull your hair out first, and if your wife hasn't killed you for the mess you've made from going crazy trying to do this. This stuffer is TERRIBLE. Do not waste your $15, it serves no purpose other than making an undifferentiated meat paste which has no recognizable components, AND it is impossibly difficult to even get it to do that well. This next stuffer was the next one I tried. It is a push stuffer. I bought mine on Ebay, a stainless steel 3 pound model. I don't remember how much it cost me exactly, but it was about $40 after shipping. The theory behind it is sound. You load the meat into the chamber, and you manually push the handle down, which forces the meat paste from the chamber into the stuffing tube and into the casing. Unfortunately, the theory is sounder than the practice. Since the piston is also made of steel, and has no gasket around it, there is a considerable amount of meat which, when you're plunging the piston, is forced out around the piston, instead of out of the tube. The sizing between the piston and the body just wasn't tight enough. For a while I remedied this by making my own rubber gasket which I would put over the meat before plunging, and that worked OK, but using this thing was just not very easy, it slipped around when plunging, and just generally wasn't fun to use. I'd say, if you're looking for the cheapest option (other than spooning the mixture into the casings), this is the one, but it just isn't great. Finally, once I'd had enough of using the push stuffer, and I got a crank stuffer. What a difference. Now stuffing wasn't something I dreaded anymore. The ground meat retained the proper texture, the meat and fat didn't smear, and it was really easy to use and clean. Wish I had saved the money and aggravation and gotten one of these right off the bat. The best deal can be had from Northern Tool, for $80 plus shipping for one of these, and it is money very well spent if you plan on making sausages or salame. 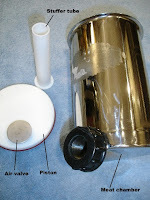 The meat is loaded into the steel chamber, and a plastic piston with a nice rubber gasket around it is forced into the chamber by the use of a crank. Yay, mechanical advantage! 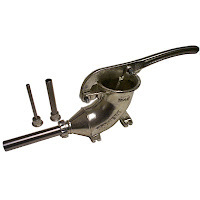 You gently crank, the piston lowers and forces the meat out the piston. It is as simple as it gets. It comes completely apart for cleaning, and running through the dishwasher, making the cleanup simple. Here are some of the components. You can see the meat chamber which holds about 4-5lbs of meat, the piston and its o-ring, the air valve to allow the air out of the chamber as you press the meat, and one of the three stuffer tubes that comes with it. Save yourself time, money and a lot of cursing, and buy this one if you need a stuffer. Wow, Nice stuffer Jason... Good going on the Blog too. I hope to see/help/taste some of your work this fall and coming year. Congrats on the MBA as well. One day you will have to outline where Deanne and I should go in Italy, it seems we both mention Italy when a European trip comes up. Their normal price is about US$67, and it's occasionally on sale. I took a sausage class at the Oregon Culinary Institute and we used them; they work just fine. Thanks Paul. That's a great deal on the stuffer. It seems exactly the same as the Northern Tool one.